Ever wondered what it would be like to go on holiday with Elvis Presley, the Real King, to Hawaii? Well, play this slot and you’ll find out – it’s just like the real deal! Think tropical beaches, colourful flowers, leis, cachi cachi music, sunsets, palm trees and the King of Rock and Roll. This is a totally unique slot game brought to you by Novomatic and we bet you’ll love it. Fans of Elvis Presley will go wild for this game, as well anyone who enjoys playing: Book of Ra Deluxe, Hoffmeister or Dolphin’s Pearl Deluxe. This slot is exciting, different and extremely generous! There are plenty of one-of-a-kind symbols that fill these reels as well as some lucrative features like the Free Spins and Multipliers that help you get lots of big wins! What are you waiting for? Load up this slot and be transported to a beautiful, Hawaiian beach where you can see the sea in the background and the wins on the horizon. Just like the King of Rock and Roll had plenty of hit singles, this slot game has plenty of hit symbols! All of them are bright, colourful, tropical and beautifully-designed! Some pay more than others, and the lower-paying set of symbols are the card values: the 9, 10, Jack, Queen, King and Ace, which can pay out up to x12.5 your bet. The higher-paying symbols are the more intricate, Hawaiian-themed symbols, which include (in ascending order of value): the lei on the leaf; the two tropical flowers; the Hawaiian instruments (the guitar and the drums); the beach at sunset and the King himself! The aim of the game is to match as many symbols as possible and you’ll get payouts if they land on consecutive reels, on winline, from the leftmost reel to the right. Some symbols pay out from 2 matching symbols whereas others pay out from 3 or more. You can check the paytable to see which ones pay from 2 and which pay from 3, as well as exact payouts for each combination of matching symbols according to your current bet. Increasing your bet will increase payouts and you can alter it using the buttons at the bottom of your screen. This slot has 5 reels and 10 paylines and you can choose to bet on all 10 or just one, and the minimum bet per line is 0.01. 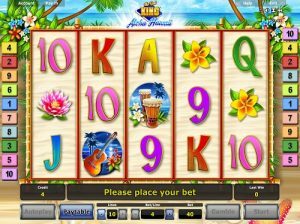 The Real King says Aloha from Hawaii in this slot and he also helps you get those big wins. Elvis is the Wild symbol in this slot game which means he can substitute for all of the other symbols and when he does, he doubles the win! How’s that for a helping hand? The beach at sunset is also a special symbol as this is the Scatter symbol. The Scatter symbol not only pays out wherever it lands on the reels but it can also trigger free games! Whenever you spin three or more Scatter symbols, you’ll trigger 15 free games and during these free games all of your wins will have a x3 multiplier! More standard features on this slot game include autoplay and gamble. In autoplay mode, you don’t have to click anything at all as the reels will carry on spinning themselves until you exit this mode. Winning never got so easy or effortless! In the normal mode, you can gamble your wins with the 50/50 chance feature where you can double, quadruple or more your win by choosing correctly the colour of the next card: red or black. Novomatic was a pioneer of online casino games and is still one of the top developers in the industry. As well as being popular, they’re also renowned for producing great games. Their slots are some of the most-played games on the internet, as are their table games and live casino games. Novomatic table games, such as Baccarat, Roulette and Poker, offer excellent RTP percentages and are super exciting to play as their quality is unrivalled. Find out all about Novomatic’s best games and where to play them online for real here at NovomaticCasino.co.uk.